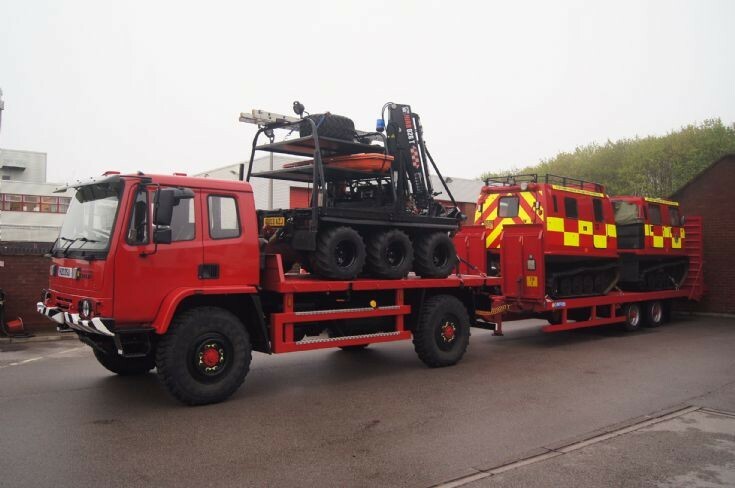 Northampton on May 1st 2012 is the flood rescue unit. In the background are Northants servce headquarters and workshops. An impressive trio. Does this ensemble turnout just as pictured? Is it driven on blue lights? Are these used purely for flood work? Thank you. Added by Monkey Boy The 3rd on 28 June 2012. Added by Kyle on 28 June 2012. Yes, apparently all pieces are ex-Army. It can't travel on blue lights as far as I know, as it's still not fitted with them - I know it isn't in either the above or my photos. The Haaglunds is registered Q536 RFE, amd the Leyland 4x4 (which was designated operational support unit originally) carries the "cherished" plate H1 OSU. Added by Ian Moore on 29 June 2012. Added by Aaldert Koster on 30 June 2012. Added by Clive Beasley on 20 February 2017.